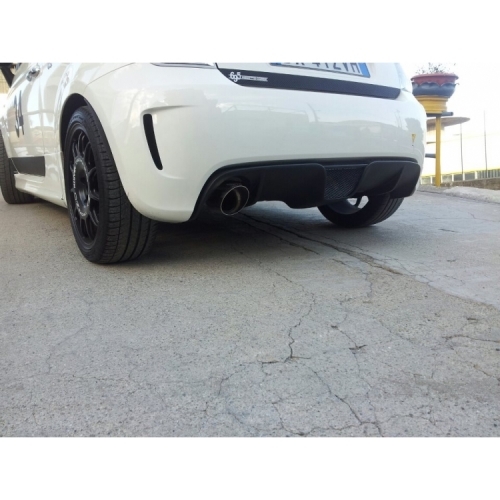 This exhaust system has been designed by the World Famous Magneti Marelli! This is a complete Race System that comes with a full three piece race exhaust and a custom diffuser. If you are looking for the ultimate in weight savings this is a great option! This Magneti Marelli Terminale 695 Exhaust System is designed for those that are looking to modify their ABARTH for track use or want the best combination of weight savings and performance. This is not just an axle back system. This is a complete replacement exhaust system that is designed to bolt on and replace the factory FIAT 500 ABARTH Stock Exhaust System. This system consists of four separate pieces. You will receive the Magneti Marelli Race Tube (2 piece design), the Magneti Marelli Terminale 695 Axle Back Single Exit Exhaust System (1 piece design) and a custom diffuser with one opening for the exhaust (replaces the stock diffuser with two openings). Please check out all the pictures in the product listing for more details. This system will unleash extra power from your ABARTH, produce a more aggressive exhaust note and the ultimate in weight savings this is it. If you are looking for a system that will make your ABARTH sound like the European ABARTH Race Cars... this is it! This system is manufactured in Italy using AISI 304 stainless steel. Due to the aggressive, race/track inspired design Magneti Marelli offers this system under the category of "Off Road/Race Use Only". This system may or may not be legal on a street driven vehicle. Please check your local laws and regulations prior to installing and using this system on public roads.